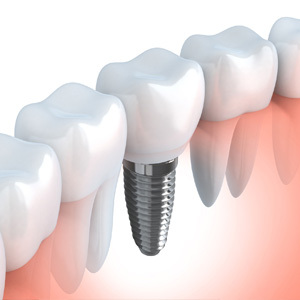 Unlike other tooth replacement options, dental implants require a surgical procedure. But don't let your imagination run wild — the procedure is relatively minor and easy for most people to undergo. Implants are unique among restorations because they replace a tooth's root. A metal titanium post, substituting for the root, must be surgically placed into the jawbone. While the procedure itself is simple and no more involved than a tooth extraction, it does require careful attention to detail before, during and afterward. Our first step is to examine the target site with x-rays (often CT scanning) to pinpoint the best location for placement. This is critical because where we place the implant will have a huge bearing on how attractive and natural the implant finally appears. From this evaluation we frequently create a surgical guide. Surgery begins with a local anesthesia to completely numb the site. You will feel no pain during the procedure and only minimal discomfort for a few days afterward. We then make small incisions in the gums to access the bone and create a small channel or hole. Using the surgical guide, we then initiate a drilling sequence that gradually increases the size of the channel until it's the size and shape of the implant post. One thing we must do at this point is take our time: we use gentle pressure and water-cooling to avoid overheating and damaging the bone. Once we're finished with drilling we remove the implant from its sterile packaging and imbed it directly into the prepared channel. It's then a matter of verifying the location with x-rays and then closing the gum tissue with self-absorbing sutures if necessary. Most patients only need mild pain medication like aspirin or ibuprofen to manage discomfort afterwards. You won't even notice it in a week or less. After several weeks in which the bone grows and adheres to the implant (a process called osseointegration), you'll be ready for the final step, attaching the life-like porcelain crown to the implant. Although the process can take several weeks to months, your discomfort should be minimal at any stage. In the end, your patience will be rewarded with a new, more attractive smile.